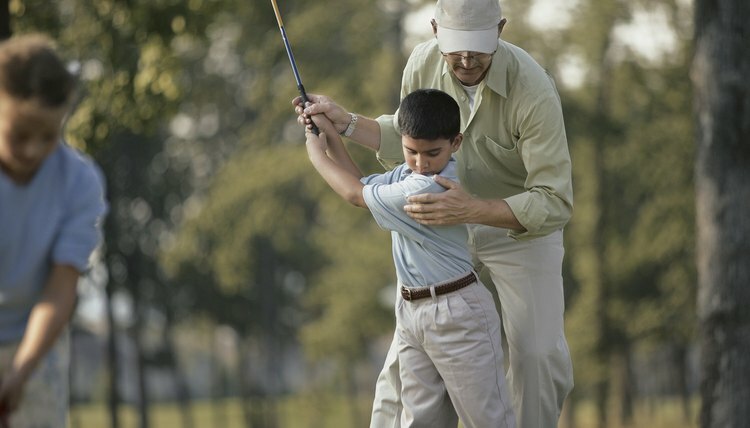 Taking golf lessons from a certified pro is a key to improving your game. A scratch golfer has a handicap of zero. Ask a dozen golf pros how to become a scratch golfer, however, and you might receive 12 different answers. Some will tell you to focus on your short game. Others will emphasize the mental approach. Still others will suggest you work on your overall swing. Whatever approach you take should fit your game and learning style. Very few people are born with a natural golf swing. Those who are still need help to refine their talent and adapt it to different situations on the course. To find a qualified golf instructor, seek a PGA-certified pro or a one who is a member of the United States Golf Teachers Federation. Consider interviewing several candidates to find one whose teaching style you are most comfortable with. Golf writer Harry Hurt suggests asking teaching pros about their golf background, and the full-swing, short game and putting methods they employ. Hurt also recommends asking them about their teaching philosophy, and how much practice and play you’ll need to reach your goal. For a pitch shot, PGA pro Jeff Ritter says to play the ball in the middle of a narrow stance, with more weight on your front foot. On shorter chip shots, Greg Norman advises players to use an open stance with their heels 6 to 8 inches apart, to choke up on the club at least 1 inch and to take a short, natural-feeling swing, using little or no wrist break on very short chips and more wrist action on longer shots. PGA pro Blake Cathey says right-handed golfers should practice putting with their right arms to improve their rhythm and avoid excessive wrist action. Golf instructor Krista Dunton advises players to set up for a putt with the ball forward in their stance. Make sure your eyes are over the ball, the putter’s head is aligned with your belt buckle and that your arms are bent and your shoulders are square to the target line. Dunton says to keep your lower body still as you take your stroke, and to maintain the same tempo from the backswing through impact and follow through.